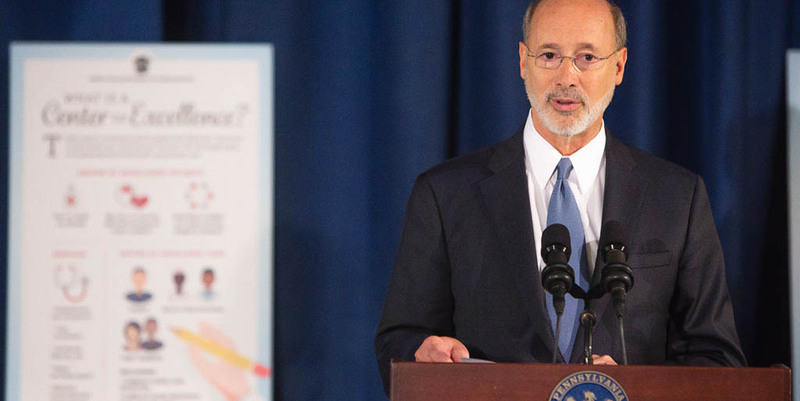 Harrisburg, PA — Governor Tom Wolf joined PA Department of Human Services Secretary Ted Dallas at two Centers of Excellence today to discuss the significant strides made in the 2016-17 budget to combat the opioid abuse and heroin use epidemic in Pennsylvania. The Wolf Administration successfully secured the necessary funding for DHS to open 20 Centers of Excellence (COEs) statewide by October 1, 2016. Governor Wolf and Secretary Dallas visited the Allison Hill location of Pennsylvania Counseling Services in Harrisburg, as well as the Treatment Trends, Inc. center in Allentown. The use of medication (like buprenorphine, methadone, and naltrexone), coupled with wrap-around supportive services, can prevent people from relapsing and improve their chances for recovery, ultimately driving the aforementioned statistics in the opposite direction. DHS is currently working with its actuaries to determine whether additional COEs can be funded by analyzing the impact they will have on the physical and behavioral health Medicaid managed care rates. For more information about the Centers of Excellence, visit www.dhs.pa.gov.